The first time I tasted Peru’s seco de carne, I thought I was in the wrong country. 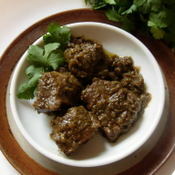 This beef and cilantro dish could have been served at a market fonda in Mexico. It had all the right flavors—beef, cilantro, onion, garlic and green chiles. Add rice, beans and tortillas, and you would have a totally Mexican meal. But I was eating this in Lima. Not so strange, though, because foods from Mexico trickled down to Peru during the Spanish colonial era. Seco means dry, and seco de carne has little sauce. What makes the flavor so bright is a last minute squeeze of lime juice. This, too, is a practice in Mexico, where lime wedges accompany soups, meats and even tacos, all of which taste better with a tangy splash of citrus. 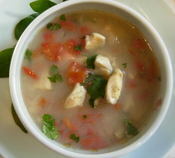 Combine the cilantro and broth in a blender and blend until the cilantro is finely ground. Set aside. Heat the oil in a Dutch oven, preferably nonstick. Add the onion, garlic and chile and cook over medium heat until the onion is tender, about 7 minutes. Raise the heat, add the beef and season with salt and pepper. Cook, stirring often, until no longer pink and any liquid cooks away, 10 to 12 minutes. Add the cilantro mixture. Reduce the heat. Cover and simmer 1 ½ hours. The liquid should be reduced to a thick sauce. If not, uncover and boil until reduced, 3 to 4 minutes. Serve with rice. Accompany each serving with a lime half to squeeze over the beef. Lomo saltado (stir-fried beef) is a curious dish. Although it sounds Chinese, it is genuinely Peruvian, but then Chinese food is as basic in Peru as burritos and pizza are here. The flavor of the version I make isn't Chinese at all. It contains soy sauce, but no ginger root. And the sauce is tangy with vinegar rather than composed of broth, wine, sesame oil and cornstarch thickening, which is the Chinese way. 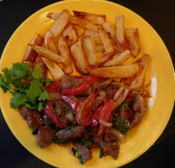 In his monumental "Diccionaria de Gastronomia Peruana Tradicional" (Dictionary of Traditional Peruvian Gastronomy), published by Universidad de San Martin de Porres in Lima, Sergio Zapata Acha defines lomo saltado as a mestizo dish with Spanish influences. It has evolved, he writes, from simple salted meat to a tasty, colorful blend of meat, tomatoes, chiles, onions and garlic. Oddly, the typical accompaniment is French fries. And the dish is often served with both rice and French fries. The following recipe is based on one from "La Verdadera Cocina Criolla" (True Creole Cuisine), published by Corporacion Editora Chirre. I came across this small book in Lima while shopping at Larcomar, a mall dramatically carved into a bluff overlooking the Pacific Ocean. I've made some changes. The recipe said to mix the French fries into the meat, but that sounded nasty so I put them on the side. And I have replaced the Peruvian aji amarillo (yellow chile) with sliced jalapeno and reorganized the preparation. Some recipes suggest flaming the meat with pisco, the Peruvian alcoholic beverage. This would be nice for Peruvian Independence Day July 28. But I'm celebrating with typical straightforward lomo saltado. I prefer my pisco on the side, the better to offer a toast to the holiday. Prepare all the ingredients before starting to cook. Cut the meat into short thin strips, as for stir-fry. Cut the onions in half through the root end then crosswise in thin slices. Halve the tomatoes, squeeze out the seeds, then cut them in thin strips. Mince the garlic. Cut the chile in half, remove the seeds and cut crosswise in thin slices. Chop the cilantro leaves coarsely. Combine the soy sauce, vinegar and water in a small cup. Heat the oil in a wok, preferably non-stick. Add the meat and stir fry over high heat until evenly browned and any liquid cooks away. Season with salt and pepper while stir-frying. Remove the meat to a plate and set aside. Add the onions, garlic and chile to the wok and cook until the onion is softened. Add the tomatoes and cook until softened. Add the soy sauce mixture and bring to a boil. Return the meat to the pan and add the cilantro. Test for seasoning and add more salt if needed. Mix well, then continue to cook for 3 minutes, stirring. Turn out onto a serving platter. Accompany with French fries or rice.